The West Village is the perfect neighborhood for date nights – from intimate wine bars to celebrity chef restaurants. For your next night out with Mr. Right, make reservations through gDine at Betel, an Asian inspired bar and kitchen in the heart of the West Village on Grove Street. Betel is one of the first restaurants to partner with gDine’s NYC launch, offering pre-paid shopping offerings for group dining. Reserve Betel’s 10 course tasting menu on gDine for only $40 per person! The 10 course Chef’s Selection is offered for $50 per person when ordered at Betel without gDine. By booking ahead on gDine, you'll save $20 on this dinner for 2 – without having to print a coupon, show a voucher on your iPhone or even mention a deal. Once you’ve booked online with gDine, the wait staff will be ready to serve you your pre-paid deal upon arrival. Betel believes “a meal is best shared”, which is why they encourage reaching across the table to taste, nibble and interact with your date or friends. Hama Hama Oyster kicks off the tasting menu. These fresh oysters are highlighted with red Nahim Jim cilantro & fried shallots. Smoked Duck Sausage Betel Leaf with ginger & chili has a very spicy kick. Bite the chili with caution. Pork and Prawn Dumplings with Chinese black vinegar sauce is a traditional dumpling for two. Salt and Pepper Cuttlefish served with Vietnamese dipping sauce is lightly fried for a calamari-like crisp. Sweet and Sour Pork Ribs with roasted sesame seeds bring a gourmet flavor to Chinese delivery style ribs. Green Papaya Salad with snake bean peanut and cherry tomato adds a refreshing balance to the meat heavy dishes. Duck and Lychee Vietnamese Pancake with cucumber relish combines a flaky pancake with fatty duck bites in a fiery dressing. Yellow Curry of Delicta Squash with shallots has creamy coconut notes for a comfort food feel. Caramelized Braised Beef Rib with coriander and Nahm Plah Prik is tender, yet crispy for a hearty finish to the savory meal items. Cassia Bark Banana Fritter with Roasted Coconut Ice Cream balances a fried shell banana with cool and creamy ice cream for a happy ending to this tasting dinner. 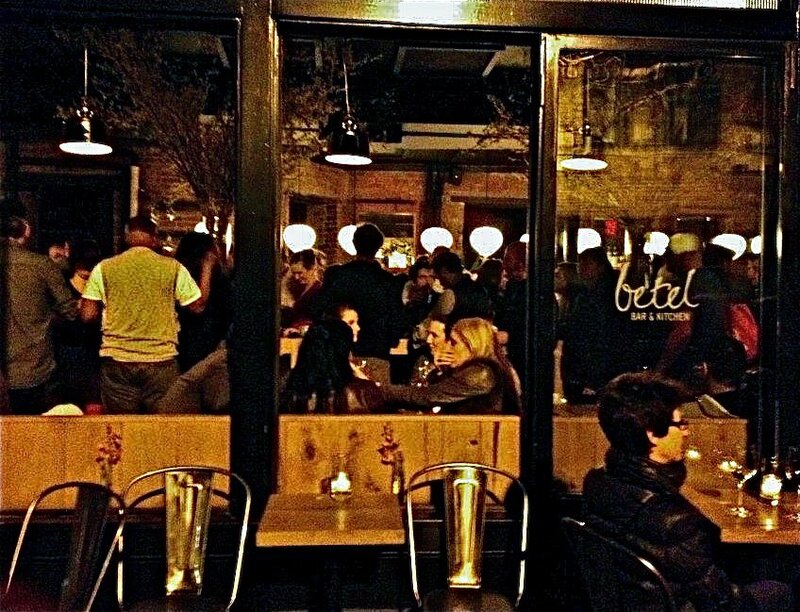 Make sure to book your reservation at Betel through gDine to take advantage of this discounted price and check out other participating restaurants for more pre-paid deals in NYC! Take a video tour of Betel's atmosphere, food and cocktails!